Every once in a while a new bait hits the scene accompanied by considerable hype. The Big O, Flukes and Sluggos, tube jigs, swim baits etc…. There is one revolutionary bait that I believe surpasses them all with its overall effectiveness and that is the stick worm. Why are these the go-to confidence bait for more Bass anglers worldwide? Simply put, it’s a presentation that is so natural and life-like, bass all over the world just can’t resist it. Stick worms are salt impregnated, soft plastic worms with a long slim profile. One key is that these baits have a quivering action on the fall which perfectly mimics an injured baitfish. Yea, it’s no wonder why stick worms seem to knock ‘em dead pillar to post, they represent an easy meal to hungry predators from rivers to sea. With that said, let’s expand on how to rig ‘em, and how to present ‘em so you can fill your live well and your photo albums with big bass and great memories. Weightless Stick Rig: My favorite; this rig never lets me down. In the last decade I’ve hooked so many trophy bass on Bass Magnet Quiver Sticks, which are by far the most durable, action laden stick worms, and are my all-time most effective plastics bar none. Rigged weedless/weightless on a 3/0 EWG (extra wide gap) hook, backed by 20-lb Power Pro braid, coupled with an 18-24” 10 to 15-lb fluorocarbon leader. Rod/reel- 7’ med/heavy/fast carbon fiber blank, medium arbor reel. The key with this rig is that the stick worm must be rigged pin strait, not only for a proper, natural presentation, this will also minimize line twist due to the bait spinning on the retrieve. As far as how I fish this rig, there are several ways to present it to hungry or territorial Bass alike. Jamie Wilson (Photo by Chad Trotter, CSFL Pro). 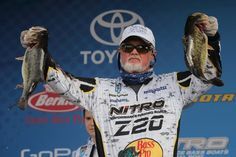 Skipping– This is sometimes the most effective and exciting way to catch big bass hanging out under docks and overhanging trees/laydowns. A stick worm has no appendages, so it skips easily getting into areas other baits just can’t. Imagine skipping a stone at the beach as a kid, draw a small circle with your rod tip and make a quick snap parallel to the water’s surface. This will shoot the stick worm under overhead cover that big bass call home. Even if you don’t get a feeding response from that big girl, you may get an angry territorial strike. Strolling- Now some anglers don’t believe you can cover much water with a stick worm, not true. This technique is great for a co-angler at the back of the boat. Basically, dragging this rig through weed cover over varying depths can be deadly for catching neutral Bass. 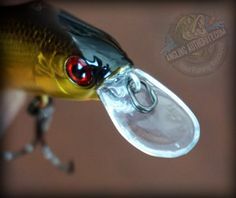 Much like ripping hair jigs, “strolling” triggers a reaction bite at a slower speed. As the boat drifts across an inside weed edge/flat/weed rock transition the rig will get caught up in the cover, pulling it free and letting it sink into pockets forces a bass to make an ultimately hasty decision before that easy little meal vacates the premises. Weighted Stick Rig: This is a modified version of the “Texas Rig” and is a great way to present a stick worm to bass deep in weed cover. The fact that it is weighted, this rig can be effective for pitching to targets and getting the bait to the fish as fast as possible. Stick worms are very slim and are perfect for “Punching” through heavy weed cover the weightless rig just can’t. Bass Magnet Lures staffer Michael McNaught explains his set up and technique that fooled this big Bass (pictured here). Michael favors a 7’ medium action spinning combo(2500 series reel) spooled with braided line as light as 8-lb test coupled with a 24” 12-lb fluorocarbon leader. His hook of choice depends on the size of stick worm he chooses, so in this case Michael rigged a 5” Bass Magnet Quiver Stick (Golden Shiner) on a 3/0 ewg Owner hook, paired with a 1/4-oz bullet sinker held in place by a sinker stopper. 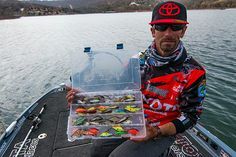 Presentation – Michael prefers dragging this rig through scattered weed clumps or weed edge transitions; “I was dragging this rig on a drift, across a point adjacent to an island. The key was dragging the rig through weed patches mixed with rock piles. When I felt the bait rip free of the weeds, I would add a couple twitches and let it free fall momentarily” See a pattern here ? Michael covered a large expanse of water with a drift and drag/twitch pause presentation which in my opinion is key to the stick worms effectiveness…and Michael’s success on the water that day. Rory Cummings (Photo by: Nicole Palotta, Courtesy of CSFL). Wacky Rig: This is probably the most popular way to fish a stick worm. Rigged with an octopus style hook in the middle of the bait, the stick worm falls slowly with both ends fluttering. Earlier this year I was in a tournament against some of the best bass anglers in Ontario. The bite got tough in the early afternoon and I decided to downsize to a 4” wacky rig which ended up catching a couple bass that put us into the top twenty. 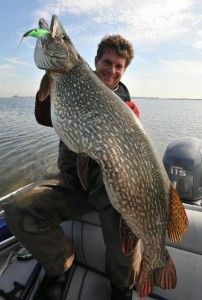 Bass Magnet pro-staffers Rory Cummings and Tony Lauzon used larger 6”wacky rigged stick worms and got the bigger bite. Suffice to say they bested us and placed in the money that day, and this is how it was done. Rory and Tony’s rod/reel (baitcaster)combo of choice- Heavy/fast action G-Loomis GLX rod paired with a Shimano Chronarch reel, spooled up with 50-lb Power Pro Super Slick. Here’s where it gets a little more technical and a lot more intriguing. First off, Rory and Tony color the last few feet of line in black increments to break up and camouflage the rig. They both favor a 6” Black Blue Bass Magnet Lures Quiver Stick rigged dead center on a #4 Wacky hook(light!) Now this is the clincher. Rory went on to explain to me how to not only catch fish with this rig, but how to save money and ultimately keep from re-rigging worms that get torn up constantly. He suggests fitting a plastic/rubber ring, or in his case, a ¼” rubber/plastic hose onto the Stickworm. “Just take the Quiver Sticks of differing sizes into the hardware store and fit them accordingly. Once you have the right size, which can be purchased for about 70 cents per/foot, cut the hose into ¼” lengths, slip it onto the Quiver Stick, then simply rig the hook under the hose”. This little trick will save your baits and your wallet no doubt and will keep your bait where it belongs…in the strike zone. Presentation- Rory and Tony lean towards ambush points along weedlines/edges of about 6 to 8-ft deep. It’s simple. 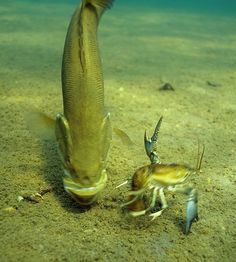 They fish for opportunistic, territorial and hungry fish all at once. 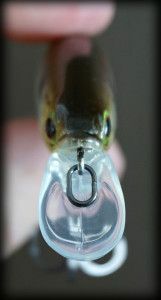 Medium depth weedline edges adjacent to spawning grounds can be year round producers for big bass and what better way to tempt them is there than a lure that looks like a injured bait fish ? The rate of fall and lifelike action make a stick worm temptation at its best. Great tips, fishing senkos are one of our favorite tactics for fishing in tough conditions!